Digital transformation and automation are hot topics – they’ve been hot topics in one guise or another since IT was born. But despite their proven effectiveness and capability to enhance the way a business operates; many businesses only pay lip service to improving their internal processes in earnest. Why is this? The two most common reasons are that either they’ve been burned by a project or initiative that was sold to them using automation and digital transformation tags as buzzwords which then failed to deliver substantial results, or they’re distracted by the more visible (but less impactful) new campaigns being generated by marketing or sales. This obsession with searching for new horizons whilst leaving the internal business to fall into disrepair is seen all too commonly. Even in manufacturing, companies who have been improving their production processes relentlessly for decades seem to have forgotten to apply the same fervour for efficiency gains in the back-office. There are huge gains to be made from automation, but it must be business-led and with a focus on ROI. 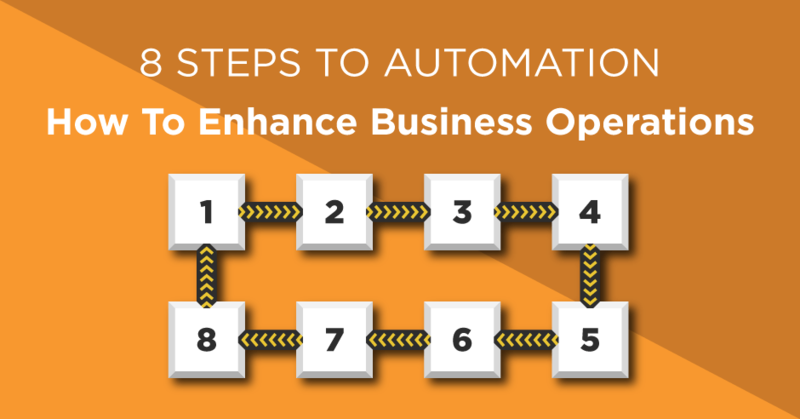 This early on, you shouldn’t be looking at the tools to conduct your automation. Nor should you even be looking for external consultants. You need to instead get a general feel for what could be improved and what should be improved in the business. This is a straight forward exercise of breaking down the business into its component parts – typically into departments. Then listing all the business operations/processes within that department, such as client onboarding, lead-processing, invoice processing and debt collection. You should then break down these processes into steps and actions. If you can use a flow-chart then great, else just map it out in a way that the team understands. Regardless of what method you use, it is imperative that you are as precise and detailed as possible at this point in your journey. Every concurrent step follows on from this one, so ensure you start on steady footing. The more detail you add, the simpler it is to see areas that can be automated which saves future you time and other resources. As you go through your analysis you’ll start to see areas that can be improved quickly. You’ll also typically see that many internal processes can be broken down into two core types of task – actions and approvals. Taking a typical and traditional expenses procedure as an example: An employee would open an expenses sheet and enter the details of their claims, scan in all their receipts, print the form and receipts, sign the form, hand it to their line manager, they sign-it, it’s scanned back in and finally sent to accounts for payment. You can see from this that even with simple tasks, there’s a good deal of steps and many opportunities for automation. However, there are also some stages that are impossible to automate – the signatures are a notable example. These can still be digitised, however. The real purpose of this step is to gauge how and where automation/digitisation can make an impact. By identifying processes that have wide stretches of actions which could be automated or lots of approvals that could be digitised you can create a priority list of tasks that you should address to have the biggest impact. The more steps and touches by people the greater the potential impact. Thanks to the rampant rise of technology and globalisation, you are likely to be able to find tools and applications that fit your requirements relatively easy. Of course, many systems will be able to take over many parts of your operations and the processes within them. If you can find one system that can deliver greater efficiency and ultimately customer service then it’s potentially going to save you costs, integration headaches and upgrade hassles. On the flip-side it’s important that during this stage you find a system that maps directly to your requirements, rather than trying to change your operations to fit a system – which can happen with complete business systems that blend various applications and operations, i.e. Practice Management Systems in law firms, ERP in manufacturing, etc. You may have to create a blend of systems to deliver a highly configurable system. As in essence you then get a much more powerful solution that will deliver you greater results and potentially a greater edge over your competition. Lots of tiny improvements soon mount up into a measurable advantage. A clear requirements analysis is really going to help you see the gaps when looking at software solutions and systems. Do understand that it’s common to buy a total business system and then not use large pieces of it because those parts don’t truly map to your operations, i.e. you use the accounting and service elements but don’t use the CRM functionality – potentially using a 3rd party solution that integrates better. Once you’ve mapped out your processes, bundled them into relevant categories, evaluated where the big wins will come from and have a solid system/application more or less identified then you have a clear starting point. Now it’s time to look at the project delivery. A clear time-bound plan along with sensible milestones is essential to deliver returns from a digitisation project. You should be working in conjunction with vendors and (if relevant) developers, along with internal affected teams to create a project plan that you all buy into and approve. It’s important to of course consider costs, not just the hard costs but also the soft-costs – which will often make or break a project in terms of delivering a business enhancing result. If you are looking at numerous digital transformation projects, it’s important not to fall into the trap of rolling out too many projects at once or back-to-back. Too many companies go for fork-lift upgrades where they change numerous projects at once and that can cause fatigue and frustration in the user base at best. Create a considered road-map that will give staff time to become accustomed to new ways of working or new systems before undertaking more change. Testing can never be overrated. You can only ever deliver an effective digital transformation project through a rigorous and considered testing plan. Ideally, you’ll be able to pilot the new process or system in a real-time test environment to see the difference it makes whilst ironing out any issues as you experience them, prior to a wide-scale roll out. This is increasingly possible now since many applications and systems are now cloud based, allowing you to trial a system in a fully-fledged test environment without signing up for long-term contracts. If there isn’t a way to preview the effectiveness of the new process or system, it’s important to agree what success looks like with the vendor far in advance of signing an order or contract. Too many businesses sign-up on a sales person’s promise, only to end up with a dud project as no clear deliverables were agreed at the start. It should be noted that if you have stakeholders, i.e. users of the system, ensure that they are happy with the testing. Without stakeholder and user group sign-off you can find yourself surrounded by disgruntlement and finger-pointing. Make sure you tie everyone into success. Once you’ve signed off your testing and pilot as a success, it’s time to finish your roll out and go live with your new system. If you’ve got to this stage successfully everyone should be raring to go (communication is everything) and fully trained. You should now be following your project plan as you bring the solution live. It’s also important to document and analyse any issues that arose along the way and discuss them in a ‘lessons learnt’ session with the project team during or after the rollout. We all grow through difficulties, and our experiences can help those who follow after us on other projects. After you’ve delivered your automation project it’s important to formally look back to what your objectives were at the beginning to ensure you’ve met them. It’s also important to do a formal follow-up meeting once everything has been running for a few months and maybe after the first year. If you can clearly demonstrate the value and business enhancement over a period that’s exciting. It will also transform a boards perception of IT and drive it to the centre of the board agenda – which it should be right now. Digital transformation doesn’t have a clear end. It’s all about continual improvement and so should in effect be a never-ending cycle. It’s very unlikely that the change you have instilled is perfect and can’t be improved. If you want to grow your competitive advantage and/or profit margin you should be managing change as you go; whilst also revisiting the whole process in specific time-frames, this could be every 3 months, 6 months, annually or longer if appropriate (unlikely). Ideally, now you’ve gone through the motions, innovation, automation and transformation should have become part of your standard operations. Your board will hopefully be demanding it. Digital transformation is without a doubt a buzz term. In reality, it’s LEAN and continual improvement rebadged. It’s something every business should be doing in a structured manner to survive and thrive in a global business environment. The challenges are out there, but there’s so much more to be gained than feared. Call 01202 055400 or click here to request a call back or make an enquiry. Click here to find out more and request information.